That was a hell of a game, huh? After 90-plus minutes of some of the highest-level, most intense international competition you're likely to see, the United States Women's National Team (USWNT) defeated Germany in the Women's World Cup semifinal, by a score of 2-0. Which means, obviously, that they're headed on to the dream contest, the final match with the top prize on the line! Simply put, you won't want to miss it. 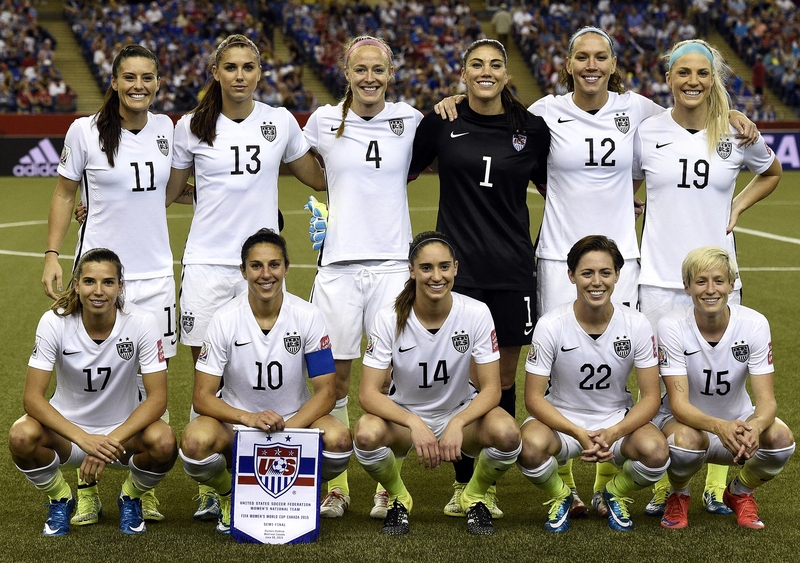 So, when is the Women's World Cup final? Some questions in life are hard to answer. This one, however, is blissfully simple: the final match will be kicking off on Sunday, July 5 at 7:00 p.m. ET, and it'll be airing on Fox. It's lined up to be a phenomenal way to flex your post-Independence Day patriotism, if you're into that sort of thing. And make no mistake, it sure beats the alternative — had the USWNT lost to Germany on Tuesday, they would've been playing a consolation match for third-place on July 4, hardly a way to celebrate. Not everything about the match is set in stone yet, however. Until today's semi-final is completed, the USWNT won't know who they're squaring off against — it'll either be England or Japan, and if you want to catch that match as a little warm-up act, it's happening at 7:00 p.m. ET on Wednesday, July 1, and will be aired on Fox Sports 1. It's a historic opportunity for the American women, who're vying to become the first country with three Women's World Cup titles. The team they just knocked off, Germany, is currently tied with them for first with two titles, and the last tournament's champion, Japan, still looms as a potential opponent in the final. Obviously, every teams competing in this highest of soccer tournaments (apologies, because I know it's "football" everywhere else) badly wants to win. But finishing in first would be a redemptive story for the Americans, who came up just short in the 2011 Women's World Cup, losing to Japan in a dramatic penalty shoot-out. It would also likely be the last chance for a number of iconic, high-level players on the USWNT — like fiery leader Abby Wambach, who's 35 years old and already playing diminished minutes, and goalkeeper Hope Solo, who's 33. When a tournament only rolls around once every four years, the age of your team becomes magnified. So here's hoping these dynamic women get it done on Sunday — be there or be square, as they say.